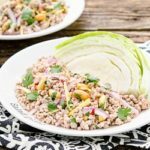 Nam Sod (Thai Pork Salad) is a healthy meal full of flavors including lime, chile, onion, ginger, peanut, and cilantro. Serve with cabbage wedges. Place pork and water in a large skillet. Cook over medium-high heat, sirrring and breaking up pork with a spoon or spatula, until pork is cooked through. Remove from heat and stir in lime juice, fish sauce, and red chile paste. Allow to cool in the skillet for about 5 minutes. Add, onion, ginger, peanuts, and cilantro. Toss to combine. This recipe is for a mild heat level. Increase the amount of chile paste to make it hotter if desired. You can stir in extra at the end.